What is that amazing piece of Pink Pyrex... you ask?! 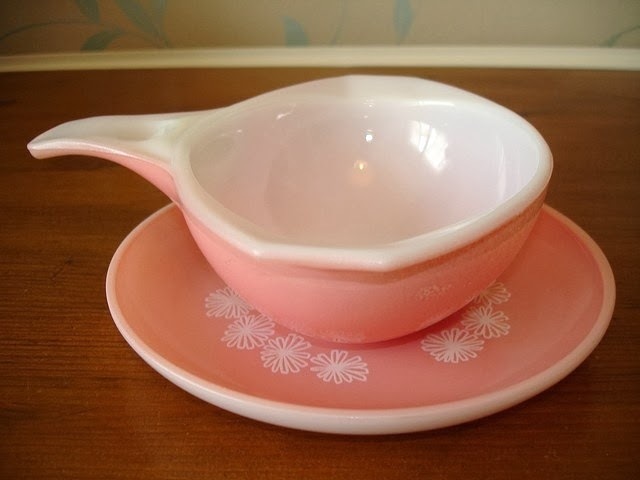 Well ladies that is the JAJ Pyrex Pink Daisy gravy boat, with its equally amazing, matching pink daisy saucer. How am I suppose to live without one of these in my life??? Now that I have seen it. I can't unsee it. And sadly this is not a US release piece of Pyrex. It is from England. "James A Joblings (for whom the company is named JAJ) acquired the license to make Pyrex in England from the Corning company..."
You really should read her full post about the JAJ Pyrex. It covers a lot of history about its origins. It is just cruel that these were never released in the US market. I wonder if Pyrex US ever released any thing like this, for us here. I can't really recall seeing anything this magical on my adventures. And they could have sold these with little effort, in the South. Where we love our gravy! 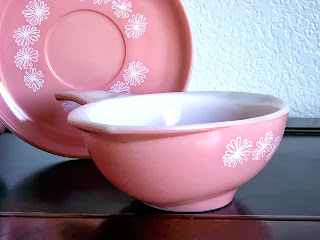 I love in Caanda, I see Pyrex from England here quite often but never anything as pretty as that piece. That is completely new to me, so beautiful and wouldn't it be cool to find one! JAJ has some unique, beautiful pieces. I wonder how much was produced? I'm just going to bed now, so I'll have to read that article tomorrow. I live in Canada, too. I see JAJ & English Pyrex all the time, although, much of it is quite ugly.